Click here to see top 250. 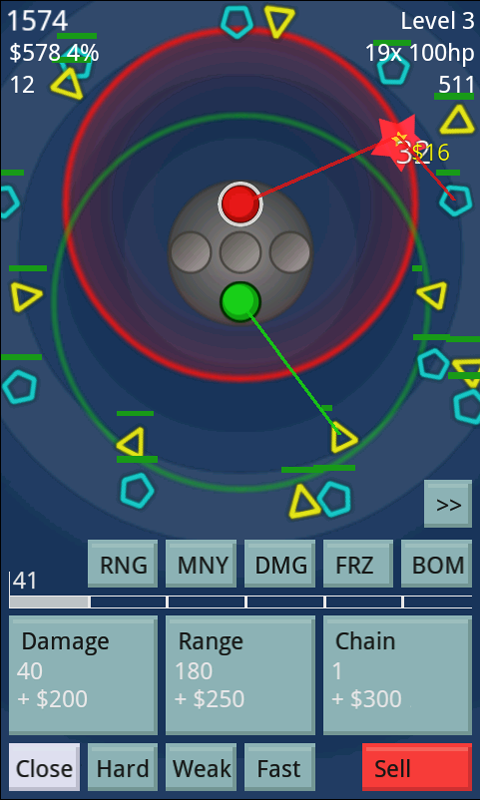 A tower defence game with a twist. You must defend your base from enemy attack by building/upgrading defence towers. Money is awarded for kills to spend on upgrades. Interest is earned on the money not spent. You must defend your base from enemy attack by building and upgrading defence towers. Money (bounty) is awarded for kills and interest is earned on the money left in the bank at the end of a level. Money can be used to upgrade the towers in various ways. Towers can be sold at a small loss, enabling you to change strategy half way through the game. Rapid - Cheapest and inflict the least damage, but fast with a range advantage. Their rate of fire can be improved. Chain - Average cost, range and damage per hit. The damage continues to a number nearby enemies. The number of enemies affected can be improved. Nuke - High cost with low range and fire rate. The damage is high with a chance to inflict x12 damage if the hit is deemed critical. The critical chance can be improved. Slower - Cheapest defence tower with the property of slowing 3 enemies to make them easier targets for other towers. Their slowing effect can be improved. Pusher - Expensive, slow, with moderate damage. When an enemy is hit it is pushed a set distance out of its spiral formation. This distance can be improved. Stopper - Most expensive defence tower with the property of stopping an enemy to make it a sitting duck for other towers. The time the enemy stops for can be improved. Reaper - If this tower is the cause of an enemy's death, there is a chance that its life may be claimed and added to your own. This chance can be improved. Gold - When this tower hits an enemy, the enemy becomes marked. If the enemy is killed whilst marked the bounty paid for the enemy is raised. Plant - Each hit on an enemy that doesn't kill it has a chance to generate power! This chance can be improved. Towers can be sold, but beware - you wont get as much for them as you invested in them! Standard - A standard enemy. Fast - Faster than standard, but lower health. Hard - Higher health than standard, but slower. Bonus - Higher health than standard, and yields a bonus when killed. The bonus can be one of: Score, lives, power, interest. Each kill adds to a power bar that can be spent on the following powers. Only one power can be active at a time and they last for one level. 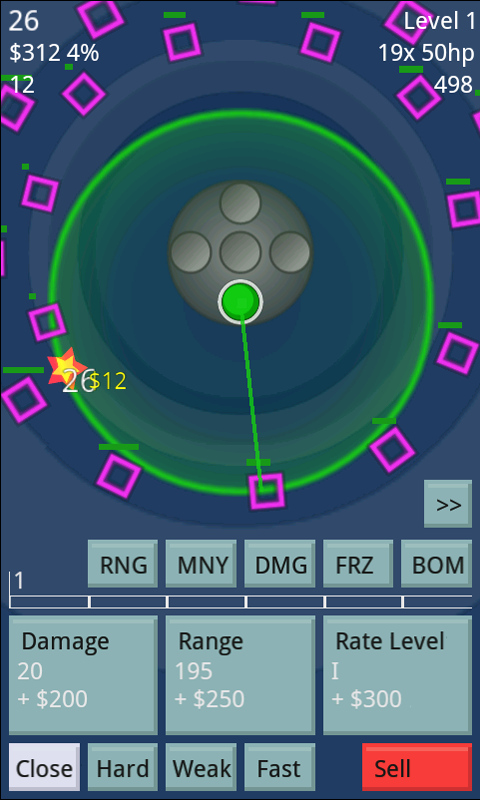 RNG (Range) - Tower range is increased. MNY (Money) - The bounty from enemies is increased. DAM (Damage) - Tower damage is increased. 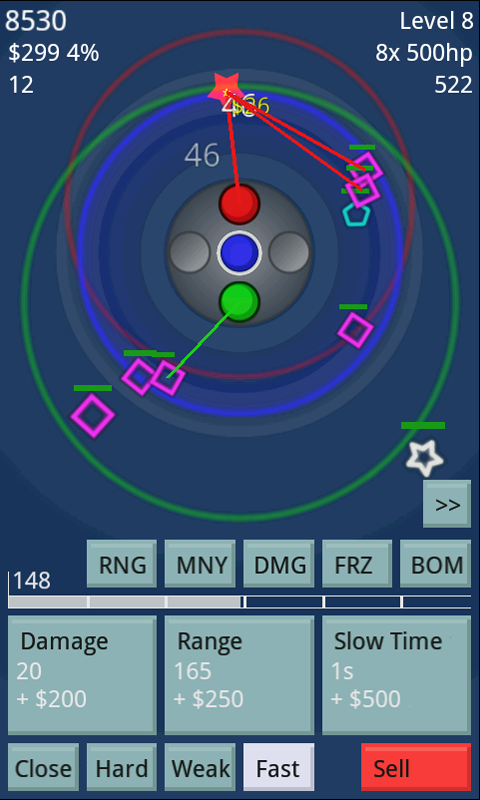 FRZ (Freeze) - All enemies are frozen and move slowly. BOM (Bomb) - All enemies explode! Practice allows to to jump into one of the games later levels with a preset amount of money, interest, power and lives. It allows you to practice different high level strategies without having to work past the lower levels first. The practice start levels are unlocked as you reach that level in the main game. Not all stats / achievements are tracked when you are in practice mode. Spend the least ammout possible each level to increase interest earned. I believe there is an option to uninstall in Settings > Applications > Manage Applications > Spira2. If that doesn't work, try restarting the phone and trying again. Why does the game require internet access? In order to support the uploading of hi score data to this web site. How many levels does the game have (Pro)? Unlimited. It's not a game you 'complete' just compete for high score / high level. I would consider level 64 to be an achievement.